Bowser and his Koopas have invaded the Mushroom Kingdom and kidnapped Peach. Mario must move through 8 side-scrolling stages, dodging Lakitus and Bullet Bills. 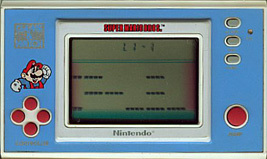 Mario can jump around on platforms, gain extra lives by finding 1UP Mushrooms and become invincible with the Starman. In World 4, Mario will be swimming under the water. As well as enemies, Mario will also have to face timed levels, auto-scrolling levels, mazes and rotating firebars.